Refrigerator models have evolved over the years, and nowadays you can find full size refrigerators in many types, shapes, and sizes depending on your needs and taste. But there is no doubt that lately among contemporary buyers who are looking for not just for size, energy efficiency and features, but also for style and trendiness, two types of full size refrigerators in particular have become more popular than the traditional single-door/top-freezer model . They are the french-door and the side-by-side types. This article will compare the two refrigerator types and present the pros and cons of both types so you can decide which suits better your needs. The french-door type was originally introduced in the nineties. It has two French doors in its refrigerator section that start at the top and go down about two thirds of the length of the refrigerator. At the bottom of these doors, there is one (and sometimes two) freezer drawer. Please refer to the pictures below for an example of a typical french-door refrigerator with the doors open and closed. The side-by-side refrigerator was first introduced in the late forties by Amana. It divides the refrigerator into two parts. Usually, the left side is a top-to-bottom freezer, and the right side is a top-to-bottom refrigerator, with the freezer side being narrower than the refrigerator side. Therefore, the door on the right side is wider than the door on the left, and it is also wider than each of the doors of a comparable size french-door type refrigerator. This means that the right door of a side-by-side unit requires more door-swing space when it is opened than each of the doors of a similar size french-door unit. Please see the pictures below for an example of a typical side-by-side refrigerator with the doors open and closed. Even though models from both types can be found with an exterior water/ice dispenser on their doors, this feature is more prevalent on the side-by-side models. The following pictures show typical french-door and side-by-side refrigerators with their doors closed and open. You will find below a comparison of French-Door and Side-by-Side refrigerators. 1. 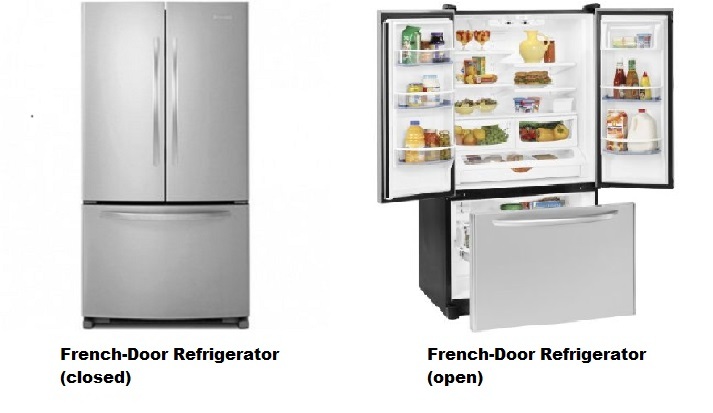 In terms of capacity, the side-by-side units offer slightly more freezer space than french-door units while the french-door models offer more refrigeration space (see the open refrigerator pictures above for a comparison). 2. One of the main advantages of a side-by-side unit is that you can organize the freezer section in such a way that the most often used frozen stuff is placed in the center or at the top, and the stuff rarely used at the bottom. This way when you open your freezer everything you need for your daily use is right in front of your eyes, and you don't have bend down to look for things as you would to reach the freezer-drawer of a french-door unit. This feature is also good for those who suffer from back problems, and who would prefer not to have to bend down too often to remove stuff from the freezer. 3. Side-by-side units always come with a water and ice dispenser on the exterior of the door. Though, nowadays, one can find french-door type units with water and ice dispensers on their doors as well, this feature is not as common as in the side-by-side models. Having a water dispenser in front of your eyes is a good thing as it would be an incentive and a reminder to drink more water which is good for our healths. 4. As the width of a side-by-side unit is divided into two distinct sections (one for the freezer and the other for refrigeration), the refrigeration side is much narrower than that of comparable size french-door type units, and it maybe harder to place very large plates and containers. The refrigerator section of a french-door unit can easily fit everything, including large trays and casseroles. So, if you tend to use more fresh foods, fruits and vegetables, the french-door design may suit you more, but if you tend to live out of your freezer, you might not find the bottom freezer to your liking. However, for some people, not being able to have enough space for large plates and trays may look like a bigger disadvantage than having to bend down to pull out a drawer to retrieve something. 5. A problem that some not very organized people might have with the french-door type is that the freezer-drawer could become one big dump bin, and you can't easily find the stuff you need to take out. So, if you get a french-door model, be sure you have some order in the drawer to make life easy on you. At least the stuff used daily should be placed in such a way that it is easily accessible. 6. Because the right door of a side-by-side unit is larger than the left door, it takes more swing space when opening compared to the doors of a french-door unit which has equal size doors. So, if you don't have much space to move around your fridge, or, if you have an island in your kitchen, and you want to allow for more aisle clearance between the fridge door-swing and the island, a french-door model might be more suitable. Note that the door-swing space requirement is one of the main reasons why single door fridges which require more swing space have lately become less popular. 7. Both side-by-side and french-door fridges offer models with alarms that sound when the doors are not completely closed. This is also true for the freezer-drawer of a french-door type fridge. 8. The french-door models are more energy efficient than side-by-sides. Refrigerators with bottom freezer-drawers use about 16 percent less energy than side-by-side models. By considering the points listed above, you should be able to decide which type of refrigerator suits best your needs. You will find below popular side-by-side and french-door refrigerators sold on Amazon. These units come with many of the features available today in the most up-to-date fridges, they are stylish and elegant, and they would certainly enhance the decor of your kitchen. You will find below all the French-Door and Side-By-Side refrigerators available on Amazon. You will note that some of these refrigerators are sold at considerable discounts with respect to their List Price. ​Have you still not found the refrigerator you are looking for?